Described as a modern day polymath, Andrew Nathaniel Forde is a notable and award winning Canadian engineer, entrepreneur, violinist, and philanthropist. Efficacious by nature, Mr. Forde is determined to leave an insightful and important impact on the world, yielding long term positive gain to future generations. Born in Toronto, ON., Andrew Forde has been both an influential and integral contributor to various industries. Through not only the building of companies, but the operation as well, Forde is equipped with the ability to solve problems through research and technology. Mr. Forde currently claims the title of President and CEO for OneOne Technologies Corporation, and previously served as the CTO of Automata, a technology company that built advanced computational engines for data acquisition and analysis. Just as well, Andrew is also a current PhD student at The University of Toronto’s Industrial Engineering department. In his elemental role as a researcher and information engineer, Forde addresses the challenges of successfully applying information technology in order to empower both people and organizations in order to drive humanity forward. Motivated by the prospect of impacting the future, Mr. Forde also holds the principle that "greatness can be developed in everyone and found in every task.” The empowerment of individuals by spreading this same principle is imperative. And so, with this principle in action, Mr. Forde believes that life should be lived in a way that benefits others through personal growth and innovation. It is not enough to contemplate the future state and possibilities of the world when dedicated study, empathy, and thoughtfulness in action, can solve the most complex of problems. Extending past his corporate and academic contributions, he has also played a founding role in creating ENGage— a summer engineering camp at the University of Toronto for marginalized youth through his Foundation. Likewise, through his foundation, Andrew has established a scholarship fund for engineering students who excel outside the classroom, as well as other international initiatives. With adept entrepreneurial skills and an insightful spirit, Andrew Forde is also a highly sought after keynote speaker. Set out to educate individuals on the importance of education, Forde devotes a notable portion of his time facilitating workshops, providing keynote speeches, and volunteering. 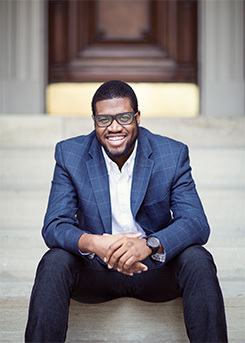 Through partnerships with organizations such as the National Society of Black Engineers (NSBE), where he served as President, Andrew has inspired youth to strive for academic excellence, providing them with the tools to achieve success. During his tenure as president of the NSBE, the organization was not only awarded on multiple occasions, but significantly increased its amount of financial support twofold, and was also viewed as one of the most important student groups in the country. Participating in a variety of STEM (Science, Engineering, Technology, and Mathematics) related programs, Forde not only funds a scholarship for polymath-type engineering students, but also has a philanthropic arm devoted to working with people who are helping themselves. In light of this, and his various other achievements and goals, Andrew was named winner of the 2012 Harry Jerome Award for Young Entrepreneurship. To date, Andrew Forde currently holds a Bachelor of Applied Science & Engineering from the University of Toronto, a Masters of Engineering in Innovation & Design from McMaster University and is presently completing his PhD in Industrial Engineering, with a focus on information science, real options, stochastic modeling and, engineering ontologies at the University of Toronto.